Perhaps a bit over-anxious for the return of spring birds, I pulled up eBird bar charts of bird sightings to look at which bird species I can expect to see returning to my area of Idaho, mine and neighboring counties, in March. It is pretty exciting! Not as exciting as May, but exciting nonetheless. This is Part Two of the Avimor Birding Blog special presentation of "On Wings of Pearl" written by my friend Michael Wiegand. Part One was posted yesterday, but you can click here to get yourself up to speed. ...the patience applies to one species and the perseverance to another...you can be the judge of it all ! the following Labor Day (2007), right on schedule Mrs. Screech Owl returned...she wasn't real thrilled with her new digs...even though it was in the exact same spot!...she checked it out a couple of times but I never saw her use it again that year...as autumn progressed into winter I would see and hear her and her mate throughout the yard at dusk as I was filling the feeders but I would never see her in one of the yard nesting boxes as is typical as courtship ensues... winter turned to spring and no sign of the owls nesting anywhere that I would expect... then one evening, as I was broadcasting cracked corn outside the back fence for the quail, I thought I saw some movement in the Lonely Kestrel canyon box...I went inside and grabbed a pair of binoculars and starring right back at me out of the kestrel box was a young screech owl...with another one jockeying for position right next to him/her! how could that be !?! well while I was preoccupied with the interior yard nesting boxes momma screech owl chose one a little more remote...but what would the kestrels think of that? it was almost summer before the little owlets fledged...I was hedging my bet that momma screech owl would take them down to the creek because of its close proximity to the nesting box but she fooled me again...instead, much to my delight, she brought them all into the yard where I had numerous opportunities to get to know all four of them before she moved them out to the riparian area later on...it was always the greatest hide and seek game when I would return home from work to see where they would be next...they moved all over the yard during their several week hunting apprenticeship often times together as a group or paired up...sometimes alone. So once again I had been blessed with a great happening in my own yard. so what were the kestrels up to??? waiting for their home to be vacated that's what! ...within a couple days of the owlets moving out and into the yard the Lonely Kestrel had reclaimed her box...back came her mate and courtship ensued...by July she was on eggs and in August, a full two months later than normal, she fledged three young falcons...and like every year in the past they came into the yard to steady their legs and gain flight stregnth in their wings where I was able to enjoy their company for a bit before the pushed off and began hunting the surrounding area with their parents. and there you have it ... a tale of perseverance and patience and two birds of prey sharing a common home for two new families! The Avimor Birding Blog presents "On Wings of Pearl", a three-part (and more to come) guest blog post by Michael Wiegand. I have worked with Michael on native landscaping and riparian restoration projects here at Avimor over the last three years. Our mutual enjoyment of birds quickly joined us as friends. His company is called Habiscapes. A couple times a year, Michael e-mails us - a small group of folks he knows will appreciate it - a narrative of his birding encounters. He has a veritable birding oasis at his home near the site of the old mining ghost town of Pearl, Idaho which is on land adjacent to Avimor. With nesting Kestrels and several species of Owls calling his yard home, things can get pretty interesting! Not to mention the Idaho rarities that seem to show up at his place every year. He also has a cabin in Garden Valley, Idaho where he feeds and monitors even more great birds among the beautiful mountain pines. His reports are always fascinating and I really enjoy his particular style of prose. His photography is pretty darn good too as it effectively captures the moments he writes about. It is all just too good not to keep to myself and Michael was willing to let me share it with my readers. Enjoy! Imagine, if you will, that you were born in a closet with only a small porthole near the top to allow your parents to bring you food periodically. How would it feel? Further imagine that early on in your life you would have to scale the inside of that closet and peer out into a whole new world. What would that feel like? And finally, further imagine that you would have to jump from that porthole to start life on your own....could you do it !?! For the benefit of those who weren't with us last year, the "Lonely Kestrel" saga began late in the winter of 2002...kestrels have nested in the immediate area for the past several years but never specifically in a kestrel nesting box I erected on a snag four years ago on an open, natural habitat piece of my property. That is until last year. One evening in March a female kestrel showed up and perched on the snag house. She called several times for her mate but no answer. A few days later she repeated the behavior as if she was advertising to her mate that a new home had been found. Again no response. She became more determined than ever and very animated often pumping her tail repeatedly as she cried out...flying back and forth between the snag house and the telephone pole they used to use as observation and territorial post together. This went on for several weeks. Her calls became more frantic and melancholy...hence the "Lonely Kestrel" moniker! ...Things really got interesting late this past winter...the "Lonely Kestrel" pair began to determine this year's nesting site in late April...round and round they went...bouncing back and forth between the old barn and pump house across the dusty old road and the snag house they used last year on my side of the road...then another female showed up...was it last year's fledgling ? ... we don't know but it really stirred things up. She hung around for a couple of weeks and then moved on. For all of May this house hunting went on frantically and then suddenly she chose one of the Flicker boxes up in the pines along side the garage. Very unusual choice as kestrels are birds of the open country...but I worried about this selection as it was right above my little nursery and an area that I had to access frequently...I didn't feel very good about a successful nesting from this site but did my best not to disturb her too much...even keeping both cars parked off the driveway to minimize distraction. Try as I might I seemed to have disturbed her more than she cared for and she often broke from the box in a tizzy. So early in June my curiosity got the better of me and I extended my ladder and climbed up expecting to see a sterile set of eggs...instead I found several fuzzballs cuddling in the center of the box! A week later I clambered up again and saw how much they had grown and I could see that there were four fledglings. On Tuesday morning, July 1st I came out in the morning to see what was going on in the box and walked right under one of the fledglings who had climbed out on a tree limb...when I looked up he let out a good sized kestrel yell and I almost fell over...I got out the camera and watched them pop out one at a time over the next few hours. Mom wasn't real thrilled about my immediate presence with her kids and scolded me from above. The first three fledglings all sat together about fifteen feet up in the pines. I could hear the other inside trying to bounce/climb up to the porthole. Seemed like it was struggling. I thought perhaps there was only one left and maybe it was the runt so I broke out the extension ladder again and opened up the inside of the box...bam! there were two kestrels left and one just blew right by me and crash landed in the shrubs below...he quickly regained his composure and climbed up into the pines...his little brother cowered in the corner of the box so I lifted him out and checked to see if he was OK. Bam! he burst out of my hand landed on a tree limb nearby barely keeping his balance. I couldn't believe there were five when it appeared there were only three at one week old and four at two weeks old...where was this little guy hiding!?! At any rate he was healthy and now Mom had five males to keep an eye on. As the day wore on they climbed higher and higher into the tops of the pines and were nearly invisible. Mom and Dad kept a good eye on them. Yesterday was fairly quiet. This morning I went out and was able to spot most of them on the west or windward side of the trees. Then suddenly two of them launched themselves out as Mom passed overhead and followed her across the road...one even paused to 'hover' like he had been doing it his whole life! A few minutes later a another one launched himself and followed his Dad around. They then took turns flying back and forth and landing back in the pines again. So the unusual nesting site was a bonus in keeping them safe from land predators and an excellent launching pad for their first flights...of course the "Lonely Kestrel" knew this all along...! When the morning is cold and dreary and the afternoon breaks forth with blue skies and a warming sun....and you are working at a place like Avimor, with a 28,000 acre backyard that needs explorin'...Shon Parks and I just had to get out of the office and go. We headed up Spring Valley Creek Trail, but turned off to head up another draw to see what we could see. The slope ahead of us was very rocky with naked hackberry bushes jutting out here and there. We heard some bird call notes and noticed movement up on top of a outcropping. 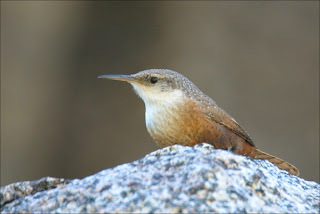 I put my binoculars on it and I immediately recognized the reddish body and white throat of a Canyon Wren. Suddenly, on the other side of the same rock outcropping another wren popped up, but this one was paler overall...a Rock Wren! Both wrens in pretty much one optic view and both first-of-year birds for me. Our hike was off to a great start! While having about a decade on me, Shon is still a lean and mean hikin' machine while I am portly and out of shape. Shon scales slopes with the ease of a pronghorn, but I'm more like a boulder that would more naturally roll down hill. Following deer and elk trails and with several stops to catch my breath and sip some water we eventually made it up the top of the draw and then decended back into Spring Valley Creek on the otherside. As we hiked down a beautiful little creek we had Horned Larks flitting across in front of us. My already strained heart almost went into full arrest when a couple dozen California Quail suddenly shot out of the brush almost under our feet with their load freakish wing-beats. Those things scare me to death every time they do that! Back on Spring Valley Creek Trail, while watching a second Rock Wren my eye caught a glimpse of something moving in the sky above us. A large hawk-like bird soaring. 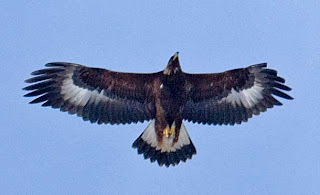 It was a huge bird with dark overall color and white wing patches...a Golden Eagle! My father-in-law reported a Golden Eagle up here at Avimor in mid-December of 2008, so it was already on the official list, but this was the first I have seen here. It was pretty awe inspiring to watch. I was already out of breath from the hike, but that Golden Eagle took my breath away again. We saw a total of twelve bird species is all and really enjoyed the hike, the sunshine, and birds we did see. I like birding. Birding is fun. I want to see more birds. I like to keep track of what I see. I want to see what others are seeing. I want more people to tell me what they are seeing. I want a fast easy way for people to share what they are seeing. I like tracking bird arrivals and population patterns. I like Life Lists and Year Lists and Month Lists. eBird combines all of those "likes" and "wants" into one neat package and satisfies those cravings for me. Now that I have found a free tool to help me, I am delighted and my soul feels more satisfied that my selfish pursuits also benefit bird science...you know in an Adam Smith's capitalism kind of way. I am excited about how eBird data will help us better understand bird behavior. It will also help us make better policy decisions that protect birds and their habitat. Other reasons for my promoting eBird are common to human nature. You find something you enjoy and you want to share it with others. Also, I want to be liked by other people, and maybe if I help them find greater enjoyment in birding through my blog and my help using eBird, they might like me. It all gratifies my pride and vanity and hopefully will help the birds and birders at the same time. This morning I was at one of Avimor's resident's homes while our HVAC contractor serviced a furnace. While we stood in the garage I heard a bird singing. I knew I recognized the song, but my brain didn't make the jump to which bird it was I was hearing. I could see several House Finches and Juncos on the surrounding rooftops, but I couldn't pick out the vocalist as I was looking directly into the sun. On my walk home for lunch just now I had my trusty Eagle Optics Ranger 8x42 SRT's on me, with good light, and I was able to see my friend the Say's Phoebe. Welcome back! Golden Eagle Audubon had a field trip to Swan Falls, in southern Ada County last weekend and they saw a Say's Phoebe there. Knowing that, I expected to see one here at Avimor within a couple of weeks, but not so quickly. Last year we had at least two mating pairs of Say's Phoebes and I got to watch them nest. But I didn't record their arrival here until April 1st last year. So the migration this year is still trending early...interesting! 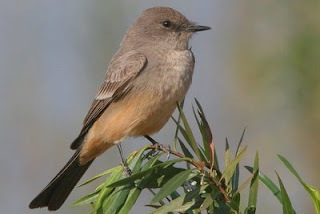 In 2008, Lynn and I recorded a Say's Phoebe on the 2nd of January in my neighborhood when I lived in Star, ID. I consider that a vagrant, not a wintering resident or a new spring arrival. I have a couple feeders up in my backyard, still testing out Bird House & Habitat's Treasure Valley Blend, and for the last few days we have had a Song Sparrow hanging out with the White-crowns, Dark-eyed Juncos, House Finches, and Mourning Doves. Though I don't see it eating seeds, it does sip and bathe in the birdbath. This is the first time I've had a Song Sparrow as a yard bird in any yard I have lived in. They are very common in the area. I see them along Spring Valley Creek regularly, but to have one in my yard is kinda cool! Within the last couple of months I have become involved with the local Boy Scout troop as a leader with the 14-15 year old boys. Saturday, we combined with the 16-17 year olds for a day of snowshoeing at Craters of the Moon National Monument, about a three hour drive from Eagle, Idaho. To make it on time we had to leave by 6am. Only about half the boys that committed to go made it. It makes me wonder if we are raising a generation of wimps or if they are so over-scheduled with other activities that an outdoor adventure isn't an immediate priority like it was when I was their age. Oh well. Those that made it had a great time! How often have you eaten lunch on top of a volcano?! The drive there took us through several Idaho counties and there was some great roadside birding. Riding shotgun with me was Jason Talbot, the president of our young men's group, who is a great outdoorsman who loves hiking, fishing, mountain biking, and hunting - check out his "fish stories" here. (all the photos in this post where taken by Jason too) He confessed that as a child he was really into birds and planned on being a great ornithologist. He was great a spotting everything from birds to antelope and it was fun having him along as I focused on keeping us safely on the road. The Tundra Swans in a pond near the highway may have reawakened his passion for birds. It was exciting to see three Bald Eagles and a gigantic Golden Eagle while all of our other passengers were zonkered-out in the backseats. We saw lots of Common Ravens, Horned Larks and Black-billed Magpies. Other bird highlights of the drive included the Northern Shrike and the Rough-legged Hawk. As we pulled into the parking lot at the visitors center at Craters of the Moon National Monument, a flock of 12 Tundra Swans flew overhead. Lennie, with the National Parks Service gave us a great presentation on the park's history and ecology, which discussion continued at convenient stops along the trail throughout the hike. I was honored the Mike Munts, the NPS biologist and a fellow birder, would join us on the hike. I really enjoyed talking with Mike and learning tons of stuff about limber pines to bluebirds nesting in volcanic rock cavities. While attending college in San Diego in 1971-1974, I would daily drive by the mouth of the San Diego River where it joins the ocean. I would look at all the gulls and cormorants hanging around and knew I just needed to be able to identify them before I graduated with my biology degree. Finally, a friend took me up to a park and I saw my first Spotted Towhee through binoculars. I signed up for an ornithology class the next semester and I was hooked. My first lifer was a Ruddy Turnstone. I came into the Wood River Valley in 1974 from an active birding community of San Diego. The only “birders” in the area were actually hunting guides. They told me some great stories of birds down at a place called Silver Creek and they knew where the Sage Grouse leks were located. Over the years we have developed a wonderful group of birders here in the Wood River Valley. I usually bird with my friend Larry (Barnes) and my other friend Gary (Stitzinger). Other times I’ll get together with the “girls” Poo (Pulliam-Wright), Jean (Seymour) and Kathleen (Cameron). The other day I was driving through Nevada and Gary called from Texas to tell me he had seen a Bare-throated Tiger Heron. A few minutes later Jean called me to tell me she had seen a Yellow-shafted Flicker in Bellevue. Chuck Trost has always been a keen source of information for Idaho birds. Bill Shillington taught me how to sit and watch birds at a feeder and just smile at all the colors. I like to travel to different places depending on the time of year. Hagerman is especially good in the fall and winter, Camas National Wildlife Refuge is exciting in the spring, Boise is good for gulls in the winter, and the Sawtooth National Recreation Area is good for owls and woodpeckers in the early spring and summer. Silver Creek area is close to where I live and you never know what is going to show up there! Don’t ever pass up Hayspur Fish Hatchery when you are driving through. I work for a river company in the summer and I find the Salmon River has lots of surprises like Western Screech Owl, Black Swift and Winter Wren. I have about 5 different books I like to keep records in including the ABA checklist and Clements Birds of the World. I tried keeping records electronically in the early stages but just when I got all my birds entered they would come up with a new program or new system. I keep track of my sightings because part of birding is the “treasure hunt.” Every time I look at my life list it reminds me of a life well spent in search of treasure. Everyone remembers their first lifer, their first bird walk, their first out-of-state trip and their first out of country trip. These are all highlights in a birder’s world. I have two stories, among the many, that stand out. In 1983, I went to Arizona with Judy Davis and Jack Trotter for the first time. We had a great time, recording about 170 different species of which about 60 were lifers. On our last night there, we decided to go find the Buff-collared Nightjar in Arivipa Canyon. The local birders had assured us that we would be lucky to hear it much less see it. When we arrived at the spot, we could see several flashlights up on the trails above us eagerly searching for the nightjar. We jumped out of the car and were unloading our gear when we heard a strange noise on top of the car. I turned on the flashlight only to see a nightjar sitting on the roof of the car. It flew up and circled overhead about 10 feet for about 5 minutes calling. As we looked up on the side of the hill, we could see about a dozen flashlights running down the hill toward us. We calmly got into our car and drove home. The second story happened in Oregon in 2003. Gary Stitzinger and I were over at Klamath Marsh looking for Yellow Rails. We spent the first night catching fleeting glimpses of the birds as they called and jumped to new positions in the marsh. The next day we happened to run into Joe Popper, the researcher in charge of yellow rails in the area. He invited us to join him that night to help him net and band rails. We had the greatest time clicking rocks together and trying to net birds. We ended up banding 4 birds that night. At 4 A.M. as I was crawling into my sleeping bag and tent, I heard off in the distance the call of a Spotted Owl. The next one, because they will have some weird bird in it that I feel I have to chase. A field guide to any dream country so you can dream about birding trips. I have a B.S. in Biology from San Diego State University. 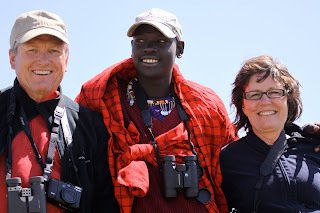 While there, I took ornithology from Joseph Jehl and I was a classmate with Jon Dunn and Phil Unitt. Strangely enough I am really comfortable with pelagic species. I grew up around boats and have been on numerous pelagic trips. I love to go owling and I’ve seen all of the owl species found in the U.S. This summer we’re planning to return to Africa and trek to the Mountain Gorillas in Rwanda and spend 10 days at a small tented camp in the Maasai Mara where we spent part of last summer. Obviously I bird constantly as she is taking pictures. 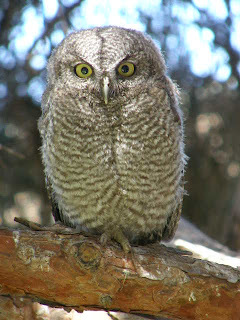 I have been the compiler for the National Audubon Society Christmas Bird Count in Sun Valley since 1975. I am also a member of the American Birding Association. I don’t really have a nemesis bird but I have a nemesis birding area- the Northeast. Every year I plan to bird in New Hampshire and Maine but end up going somewhere else. Okay- I have one. I have been looking for the Five–striped Sparrow in Arizona since 1983. I have yet to find one. My wife is a wildlife artist who specializes in painting large mammals but occasionally likes to paint birds. She is presently in Scottsdale, Arizona at a 3 month long art show. I get to go down and visit while she’s there and I usually find time to chase a Jacana or Blue Mockingbird while I’m there. Once while birding the Tijuana Slough in San Diego, my friend and I had to take our clothes off to ford a stream. Just as we were in mid-stream a squadron of marine helicopters flew over us. No time to cover up! To explain to people the little things. 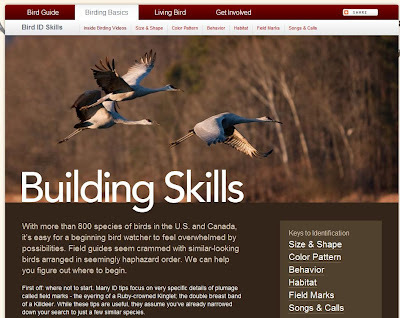 One of the birding sites I visit most frequently is The Cornell Lab of Ornithology website called All About Birds. It is a great looking website and the incredible content is very intuitive to navigate. 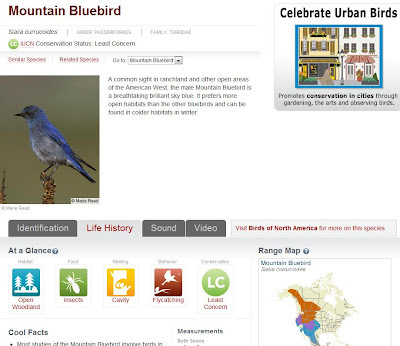 Every birder should have this website link saved in their web browser favorites! 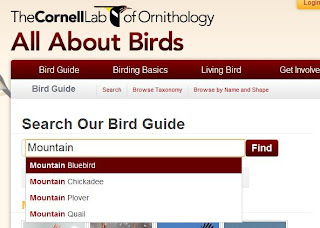 I use their online Bird Guide the most. 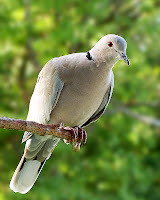 You will notice in my blog posts, whenever a bird name is mentioned I insert a hyperlink to that bird's profile on All About Birds Bird Guide whenever possible. They don't have every North American bird on their yet, but they've got most of them and they are working on adding more. I really enjoy the searchability of this guide. As you start to type in the name of the bird it automatically pulls up a list of birds with those letters in it to help you quickly narrow it down to the bird you are looking for. The content for each bird is really nice. There are four tabs for each bird: Identification, Life History, Sound, and Video. I click on the first two tabs all the time with the Cool Facts under Life History being my favorite section of all. I love maps and the range maps with an additional link to eBird's maps are very handy. The online Bird Guide is fantastic, but that is not all you can get from this website. I have also used the Birding Basics feature to brush up on my own techniques but also to learn how to teach birding skills to others on the bird walks I lead. The text, artwork, diagrams, and videos are all of top notch quality and are extremely helpful. The Living Bird section is loaded with great stuff and you can even read much of Living Bird Magazine online here. I use this website daily, but I haven't even begun to scratch the service of all that the site offers. Check it out for yourself! You can tell when American Idol has selected their final 24 contestants because just about simultaneously the best bird singers are returning to Avimor. Last year, it was on March 4th that I recorded the first Western Meadowlarks of the year. As the Red-winged Blackbirds showed earlier this season, spring migration is trending a couple of weeks ahead of last year's schedule. I was surprised to hear three of them singing from the tops of sage and bitterbrush on the western hills across the highway and I was able to spot them through my binoculars. The pitch of their song pierced through the din of traffic and Starlings and Red-Wings. It really was a fantastic morning bird walk. A coyote yipped from the eastern hills. A pair of fat cottontail rabbits (pregnant?) nibbled nonchalantly on new grass shoots within just feet of me and hardly seemed to notice me near. A Ring-neck Pheasant uttered its loud ka-tuck ka-tuck ka-tuck and I heard the distinct buzzing trill of the Spotted Towhee. Both birds heard, but not seen. A Downy Woodpecker zoomed up and down that still winter barren branches while Black-capped Chickadees cheered me with their calls. Not to be outdone, Song Sparrows were singing for the lives hoping to be included in the Idol top 10. 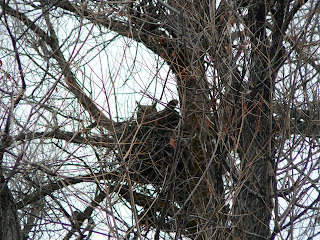 Momma Great Horned Owl looks comfy on her nest. She didn't even bother to open her big beautiful amber eyes at me this morning. Perhaps her way of snubbing the paparazzi. Just another beautiful day at Avimor! One of the great eBird tools that I enjoy using is the distribution maps by species which I have blogged about before. These maps are also important to science to track species range; whether they are increasing or decreasing. Here is another graph that eBird can spit out which shows that Eurasian Collared-Doves were reported about 2% of the time in 2005 and by 2009 they were being reported up to 5% of time. I am certain studies are underway to show if this rapidly expanding species is negatively impacting other species or not. Can a species expand and compete for food without some effect on other species? 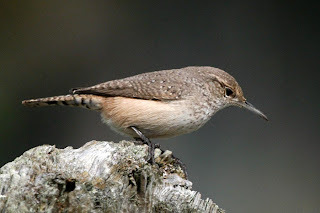 One of the Pacific Northwest birding blogs I enjoy following is Portland Oregon Backyard Birds. On their site they recently announced a separate blog from which they are selling their own hand-crafted suet blends called NePo Suet Company. Always interested in promoting my fellow bird bloggers and their endeavors, I ordered up four varieties of suet cakes. They arrived very quickly in excellent packaging. They are so fresh and they smell so delicious, how can birds resist them! They list all of the tantalizing ingredients on their wrapping. I placed the Everyday blend on my platform feeder inside of a suet cage. The birds in my backyard really took to it...House Finches, Dark-eyed Juncos, White-crowned Sparrows, and Mourning Doves. After that Everday blend was devoured I put out the Black-oil Sunflower Seed blend and now the Red-winged Blackbirds have come back to the area to enjoy the protein rich suet from NePo. I hope to get some quality pictures to show the birds enjoying the delicious new menu items I have for them. Stay tuned! The bird that did it for me was the prolific and comical deep southern personality of the Tufted Titmouse. On a spring day while sneaking thru thick Georgia bottomlands and watching deer, this little rascal landed on my head and proceeded to attempt to rip nesting material from the top of my head. He/she did not give up even after I made two attempts to grab him. He would flush to the nearest tree only to scold me and then come back for more hair. Several in my early years including my Biology Prof Bill Birkhead and my dad who always had a guidebook around the house to look at while birding the backyard. I remember it well, March 28th '93, while here on a job interview, I was fortunate enough to drive down to Swan Falls. In those days it was lush with native plant species and raptors abounded. (so did additions to my life list) Sadly today it is mostly cheat grass and Russian thistle. I bird daily always on the look out for the neighborhood sharpies that hunt the feeders. I also spend regular time at Deer Flat NWR. The remotest untrammeled reaches of the Owyhee Canyonlands seem to be my favorite place that always draws me back. As for the US, it would have to be the Mohave Desert in spring. The only worldly spots I’ve birded where the foothills of the Sierra Madre, SE of Puerto Vallarta and the jungled shores of the Nā Pali coast on the island of Kauai. Both were incredible! A highly recommended spot would have to be the North Fork of the Owyhee River in spring. Just take the road from Jordan Valley, Oregon east about 35 miles where it crosses the river and continues all the way to Grandview. The route is an official Backcountry Byway and riddled with hot birding spots all along the route. Any intact sage brush steppe community where the elevation transitions into Juniper and Mahogany forest. 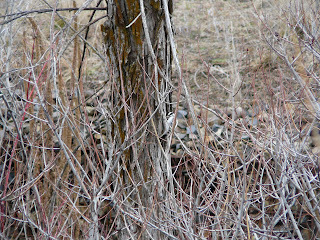 Find water nearby with willows or the occasional Aspen grove and you’ll be amazed at what might pop out. i.e.. City of Rocks, or wilderness trail at Craters of the Moon Nat’l Park. Man-o-man one cannot underestimate the advantage of good hearing. Growing up in the “jungles” of the deep south I learned time and again to be persistent and quiet so I could first hear and learn the songs/calls, often before I’d spot my lifers. A light weight backpackers 15-40x50 scope made by Bausch and Lomb and a worn out pair of Swift 8.5x44. I keep it simple, writing the date and locale of my sightings in the various field guides right next to the drawings/paintings. I do this because I like carrying the guides as talismans of my adventures so to speak and the worn out dog eared pages become sentimental prizes across the years. Cornell Lab of Ornithology works best for me. Sibleys and Nat’l Geographics in combination. 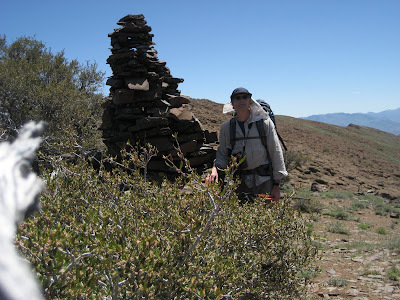 Winter of 2011, I plan to spend time in Death Valley Nat’l Park, CA. Not strictly a birding organization, however I am active in the local and state level Sierra Club as an elected officer/volunteer. Our major campaign this year will be "Resilient Habitats" which strives to identify and protect wild-lands on a connected continental scale. Time and again the Great Gray Owl has eluded me, only hearing one for several nights in the backcountry of Yellowstone’s Two Ocean Plateau, which I do not count as a lifer. Early on my brothers and I had many opportunities to run wild thru the woods and swampy bottomlands of Fort Benning, GA. Where I bonded with all things wild and hidden. These early days of observation and exploration were encouraged by my parents, mixed with stories of western ranch life, where my mother grew up on a large cattle ranch in the hills near Roseburg, OR. Without hesitation, Corvus corax the Raven. I got to hear and see a Golden Eagle carrying a still rattling rattle snake. To follow (while backpacking) Ravens to a wolf pack and prey kill site. One pitch black night while camping with my family I sneaked off to attempt a “scary” coyote howl for my mother. I stood under a large Juniper and as I loudly yelped, out from behind the limbs careened a silent attack. Narrowly missing my head on several dives was a specter of a Great Horned Owl. He showed me how to really yelp like a coyote. Highlights included: The nesting Great Horned Owl is always a delight to show to others. A female Downy Woodpecker put on a show in a tree nearby which gave the group great views. At the end of the walk we found an American Kestrel near the nest box I had put up. It was a handsome male and had a mouse in its talons. As a group we loaded our sightings into the GBBC website and I demonstrated the wonders of eBird. We also had a little seminar on how to use binoculars and basic birding identification skills. It was really a fun group of people who all seemed really engaged in birding! Remember, we still have through Monday for the GBBC! I am going to take all my eBird records from yesterday through Monday and enter them. I had an idea for a great eBird Gadget for blogs and websites. Wouldn't it be great if there was a widget that showed recent sightings for a specific location like a wildlife refuge or even your own community? I e-mailed the eBird staff about my idea. They e-mailed back saying that they already had what I was looking for. They are so good over there! I just thought I'd share how to add this to your blog or website. B. Adjust the Width and Height to your specifications. Mine is 250 px wide by 500 px tall. C. Select a border style. D. Select the time period you want the gadget to look back on. I went with 2 weeks. E. Enter the Location ID's. Okay, this is the trickiest part, but it is not that bad. ii. Click on "View and Explore Data" then on "bar charts for my locations"
iv. After clicking on the "Continue" button it brings up the bar chart of your locations, but we are interested in some of the info in the web address. Highlight the webaddress. Copy and past it into a text file or into a word processor. v. Delete all the web address info except the locations, which are L's followed by digits. Add a comma between each of the locations. vi. Copy and paste the locations into the gadget maker website at Location ID's. Then click on Get the Code. vii. Finally, paste the code into your blog or website where you wish. Then get back outside and go birding and submit more eBird checklists!